Ok I admit it, I choose a lullaby but it is as dreamy as a fairytail so I figured I could get away with it. The inside of the card little flower and a bit of faux stitching also the poem is added. Sailed on a river of crystal light, into a sea of dew. "Where are you going, and what do you wish?" The old moon asked the three. Nets of silver and gold have we?" And the wind that sped them all night long ruffled the waves of dew. And the wooden shoe that sailed the skies is the wee one's trundle-bed. Cute card Jak love the blues. This is soooo cute Jak - LOVE your take on the theme! Adorable Jak! This is a beautiful image and you've done your usual fab job of colouring it up. Love the netting, btw! This is so soft and sweet, Jak, just like a lullaby! wow this is such a precious image. You have made very cute card. A real keepsake Jak, I love it. 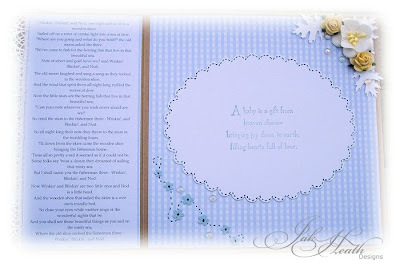 A beautiful card Jak, the image is so sweet. Oh I think this is adorable! 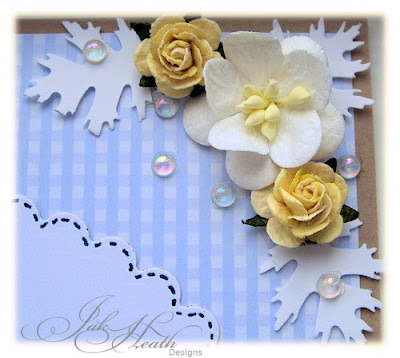 I love the card fold and the scallop oval behind !! Beautiful colors!!! OHMYGOSH!!! This is BEAUTIFUL! Needs to be in a frame! I tried coloring this one and was never happy with my results! Yours is perfect and I love the gold on the net! it always amazes me what lovely cards you create. Not only creative but so beautiful, so special!!! I'm not a scrapbooker but I love reading about what you make. Oh my, what a beautiful card. I love cards for new babies and this card is not only beautiful but also emotes the innocense and peace of childhood. Fabulous card Jak and i love the image and Lullaby. The colours are just perfect. You are so talented. Oh so sweet! I love all the little details and what a great idea to have the poem inside! How cute! I love that you put the poem in there too. But the colors are awesome and of course love the image. 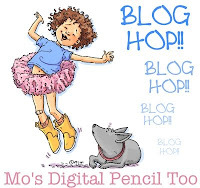 Mo does have the best images!! This is so adorable, the colours are so lovely and the image so sweet! Just beautiful Jak. TY for sharing your card and I do think it fit the theme. This is so sweet!!! You did a great colouring and even love the inside of your card. Cute card, the image is worthy of a fairytale! I am loving this fairytale theme! Your card is beautifully done, Jak. Very serene and so lovely.